You think it's bad when computers on the International Space Station get spazzed -- just imagine the chaos when the primary commode decides to stop functioning correctly. 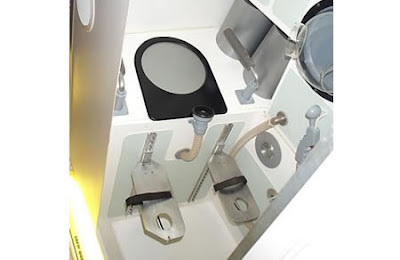 As of now, crew members are being forced to urinate in a "jury-rigged system" that's connected to the seven-year old (!!!) can, but thankfully, the solid waste collecting part has yet to act up. Still, we can imagine that folks on board are already fearing the worst. NASA officials have stated that they are currently mulling the idea of tossing a few parts on the Discovery just before it lifts off next week for a planned docking trip, which we can only hope pans out. Godspeed just took on a whole new meaning. With all our technology, and whizz bang gadgets and jumping on planes and haring around in cars all at the flick of a switch... we tend to forget we are simple sentient beings that need food and water and to make waste. Being cooped up, weightless, in a tin can in Space, must bring this potent fact home big time, and i will be saying prayers of thanks then next time i am sat in the throne room. From one tin can to another, here's to modern toilet technology at its finest. At least the early explorers could hang it over the bow, or dump behind a tree! I wonder if they offer an MBA or Doctorate in Space Waste Management? All I can think of is what happens to Farts in Space?! I wonder how "A Place to Pee" video game booth works in space? A special "shout out" to Sir Thomas Crapper. Though he didn't invent the flush toilet, he certainly did much to advance it! One would think that NASA would have a contingency plan for such an event. That's why plumbers make the big bucks. Happy Birthday Sir Dayvd of Oxfordshire! Zen Knight: Enjoy the Ride!